Last weekend Peckham became the funkiest borough of Greater London, as legendary trombonist and bandleader Fred Wesley and his New J.B’s played the Bussey Building. Fred Wesley is one of the world’s most famous, and greatest, sidemen. In musical history, he’s not just important for playing with the Godfather of Soul, but for his own unique role in the development of funk. Born in 1943 in Columbus, Georgia, Wesley would learn music from his grandmother, eventually settling on the trombone as his musical instrument after flings with both the piano and trumpet. He studied music at the Alabama State University, playing short stints with both Hank Ballard and the Ike & Tina Turner Revue. He then joined the US Army, playing in the 55th Army Band and graduating from the Armed Forces School of Music. After leaving the Army, he formed his own band but it didn’t last long. Then, his life would change forever, after receiving a call to join The J.B’s, James Brown’s backing band. At the time the Godfather of Soul was the greatest entertainer in America. His pioneering music was tearing up the musical rules and conventions, and he was setting the country alight with his dynamic stage shows. But, at first, it was difficult for Wesley to adjust to the Godfather’s musical style. Being a trained musician, his education told him the music that Brown was creating, who was not a trained musician, was theoretically wrong. But he adjusted to Brown’s insistence on playing “on the one”, and helped the development of Brown’s early funk sounds to the more sophisticated funk of the late sixties and early seventies. When Pee Wee Ellis grew tired of leading The J.B’s and coping with the demands of Brown, Wesley took over the role as bandleader, building on Ellis’ funk foundations and navigating The J.B’s into the seventies. He too would grow tired of Brown’s authoritarian manner and would quit, tempted over to another funk outfit, George Clinton’s Parliament-Funkadelic. Wesley would return for a period to James Brown, leading his Soul Generals, but would again leave, becoming an in-demand musician and arranger for the likes of Bootsy Collins, The SOS Band and The Gap Band. Today, some five decades since he joined The J.B’s, Wesley is still delivering the funk. He splits his time between two outfits: his “Generations Trio”, and his larger group “Fred Wesley & The New J.B’s”. It was this larger group, consisting of six musicians plus Wesley, that travelled to Peckham for a weekend residency on 21 and 22 April at the Bussey Building. The Bussey Building is part of the new vision for Peckham, and provides space for music, theatre, film and other artistic ventures in what was previously an industrial building. Level 1 of the Bussey Building is built for live music, mostly DJ sets. It’s a small room, featuring a small-ish bar at the rear, and a small stage at the front. In fact, it was by some impressive logistical feat that the New J.B’s somehow managed to fit on the stage at all. Even more impressive was the sound: for an old industrial building designed, presumably, for manufacturing not dance music, the venue’s sound-system and mixing was surprisingly good. Yet, what the room lacked in space it more than made up for in intimacy, perfect for being up close and personal with musical heroes. I was stood no more than two metres away from Wesley and his big horn, almost within touching distance with an icon of the funk. In fact, the people in front of us were in the “splash zone”, being at risk of getting covered in spit when the horn section drained their instruments. Not that they seemed to mind; being covered in spit is the risk you take when you get down to the funk. There were no airs or graces at this performance: a brief announcement by the DJ, and Wesley and his group appeared from being a curtain and took their positions on stage, before launching into some seriously funky music. Wesley, it’s fair to say, is getting older now and could be in better shape (he performed seated on a stool), but his enthusiasm for his music remains undimmed. Once a bandleader, always a bandleader, and Wesley orchestrated proceedings throughout. His benign rule, compared to dictatorial management of James Brown, allowed the musicians to showcase their incredible talent, inviting solo after solo from each member, each complying with Wesley’s instructions with ease. The funk was infectious, and the band were well-drilled, shifting between songs deftly at the instruction of their famed bandleader. Split into two sets, the performance was split into two 45-minute sets, separated by a brief toilet/drink break. 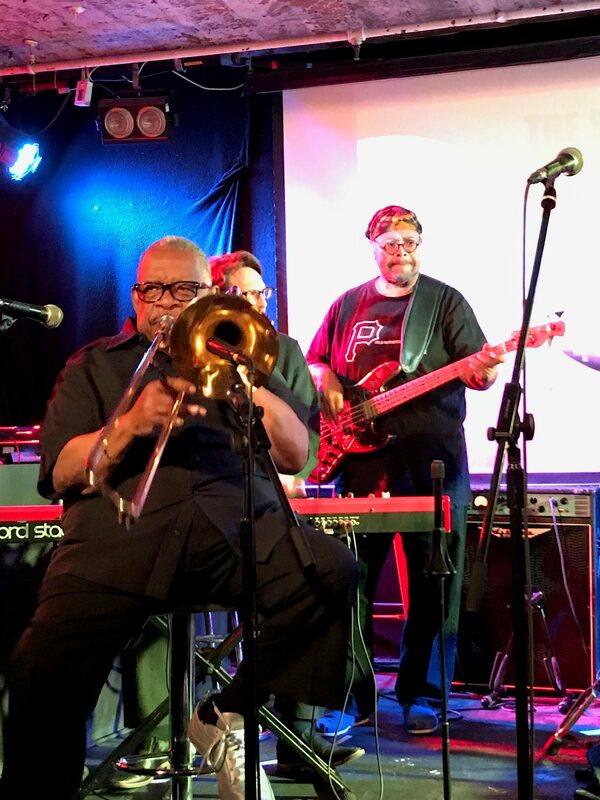 Given that the performance was only an hour and a half long, The New J.Bs managed to cram in a surprising number of songs, taking us on a whirlwind tour of Fred Wesley’s musical legacy. It was, quite simply, excellent. Today, the New J.B’s, or “The J.B’s” as they were once known (they were known as “The Horny Horns” during the P-Funk era), are a slightly smaller outfit than when they were with James Brown. Nevertheless, they recreated the classic James Brown-era funk with apparent ease, adding their own flourishes and flicks when instructed by Wesley. Today, the band consists of Wesley, Dwayne Dolphin on bass, Reggie Ward on guitar, Gary Winters on trumpet, Philip Whack on saxophone, Peter Madsen on keyboards, and Bruce Cox on drums. These musicians were very impressive; Wesley has assembled a brilliant collection of musicans who clearly love this music. This wasn’t merely a James Brown tribute act, this was a true celebration of an important, if somewhat overlooked, musical genre that underpins much of what is popular today. The band knocked out some seriously funky tunes, crafting deep grooves that had the crowd dancing immediately. Each member of the group had their turn to impress with the solos, particularly the horns of Winters and Whack. Their sax and trumpet playing was a pure delight (Winters even used a plunger to great effect at one point), while Dolphin’s bass was superb, anchoring the funk nicely. Perhaps most impressive was Cox’s “funk face” while playing the drums. It was fantastic. Highlights of the two sets included a blistering rendition of “Hot Pants Road”, one of the best songs The J.Bs recorded, along with stellar performances of “The Grunt”, “Same Beat”, “Breakin’ Bread” and “Get On The Good Foot”. Wesley found room in the first set to perform a version of Parliament’s “Night of the Thumpasorus People” from the iconic Mothership Connection album, which Wesley contributed to back in the early seventies. There was even time to revisit Wesley’s excellent House Party album; Wesley even sang the title track, and then led the crowd to “bop to the boogie, boogie to the bop, bop to the boogie, bop bop” on the song “Bop To The Boogie”. This piece of audience participation may sound easy, but you try saying that after a couple of drinks and a rail replacement bus. With the performance drawing to a close, there was still time for two more James Brown classic jams: my favourite, the ever-funky “Doing it to Death” (sometimes known as “Gonna Have A Funky Good Time” as that’s what the Godfather chanted over and over on the original) and “Gimme Some More”. And with that, the funk was over. Taking advice from his former boss to “kill ‘em and leave ‘em”, Wesley did just that: there was no encore, just a longing for more on behalf of the crowd. I never thought I’d see Fred Wesley, one of the architects of funk, in a former warehouse in Peckham. Equally, I never thought I’d witness such a great evening of music for such a low price. Accustomed to paying top money to see these ageing legends, the £10 entry fee was ludicrously low. I’m not sure I’ve ever spent a tenner more wisely. Credit is due to the promoters, the South London Soul Train, for not only booking Fred Wesley and the New J.B’s but for also putting it on at such a reasonable price. Fred Wesley is one of the great sidemen in music history, a pioneer in funk, and, it seems, a very nice man. His musical chops remain intact, and his latest group of J.B’s are worthy of the players and legacy that precedes them. If you get a chance to catch this funk unit in action, make sure you do.